It Has Loads of Torque. 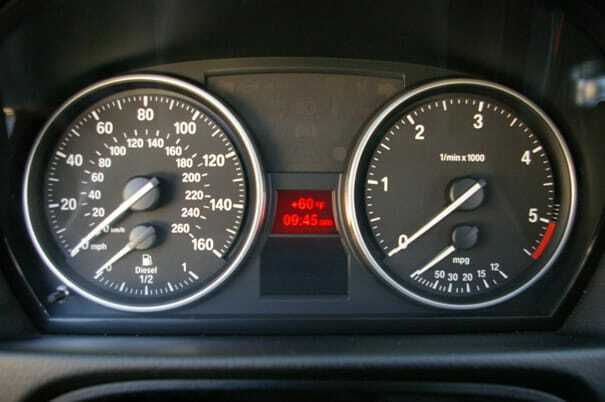 The 335d's engine may be low-revving (as you can see from the image, the redline is 5,000 RPM), but that's fine with us because it creates a mountain of torque at a relatively low RPM. Despite the engine's relatively low horsepower rating of 265, the 335d twists its rear wheels to the tune of 425 lb-ft. That's more than the Chevrolet Camaro SS, Ford Mustang GT, and the Dodge Challenger SRT8! And most of that torque can be had at around 1,500 RPM! That's enough power to wrench the truth out of Rick Ross. Want to get around a slower car on the highway? Plant your foot into the carpet and hold on. We spent an entire day on the Palisades Parkway launching past people. (All within the state-mandated speed limits, of course.) The engine may not have the most glorious note, but it sure moves like it does.